When she was only 21 months old, vast days alone with a toddler stretched out in front of me, filled simply with a walk to the playground or library, a play date, finger painting- that kind of thing. That was when I still felt around sunset that glimmer of hope that he’d be on his evening commute home by the time she fell asleep so we could chat about our day. That was when I still felt it was insane he wasn’t there on her 2nd birthday as we marched through the kitchen with about ten other toddlers banging musical instruments following the musician I had hired. A table with roses and a few of his pictures were there at the exit of the kitchen. I saw them there each time we went around. That was around when she received her first award – just a little certificate at a toddler’s gym class, but I marked it in my mind recognizing it as the very first “achievement” he was to miss. His absence glaring as she got up to get her certificate, holding it in her chubby hand. Everywhere there was absence. Empty clothes. Empty desk. Empty seat at the kitchen table. Back then there was still a chair called “Appa’s chair,” because we both remembered him sitting there. It was empty each night at the table. Someone in my apartment building told me there was an older widow in the building who still set a place for her husband every night. I did not find it strange. We know we cannot fill the emptiness, the absence. But we do try to honor it. It is too glaring to let alone. Nothing can fill the gap when we are away from those we love, and it would be wrong to try and find anything. We must simply hold out and win through. That sounds hard at first, but at the same time it is a great consolation, since leaving the gap unfilled preserves the bond between us. It is nonsense to say that God fills the gap; he does not fill it, but keeps it empty so that our communion with another may be kept alive, even at the cost of pain. She has filled the emptiness in her own way. There were imaginary friends- many of them – starting around age 3. They ate with us, talked with us, played with us. We drove by one of their houses every morning on the way to preschool and waved. There was a lot of pretending in our house. Sometimes she begged me to pretend to be Mary Poppins, which I did. “Spit spot, time for bed!” She told me things about her day as if I was truly another person because…we needed another person. Sometimes I was the voice of her Barbie mermaid bath toy. And sometimes I worked at “Julia’s Nail Salon,” where she came after knocking on the wall. While I pretended to be a nail salon owner she’d just met (not her mom), trimming or painting her nails, she told me about her first day of school, or her upcoming birthday. She needed to tell someone else. There are her dolls that sit at the table with us for most meals. Placeholders. On our first vacation alone as a family of two this past spring, her favorite doll accompanied us. The man at customs asked for her doll’s passport in a serious tone. She laughed and looked at me for guidance. 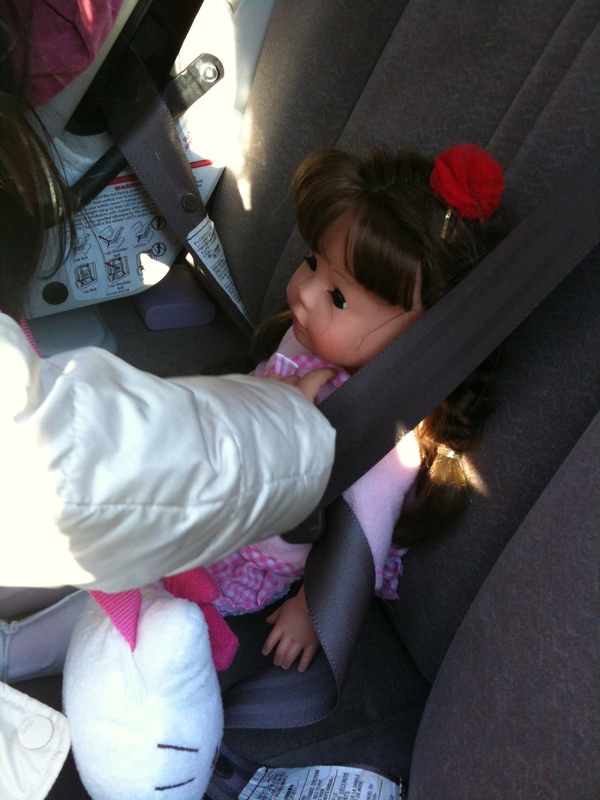 The waiters at each meal smiled at me, and asked how the doll was doing. She and her doll even sat eating breakfast in bed together, a special request of hers. There were also a lot of stories in our home with lots of characters to keep us company. Peter Pan and The Lion, the Witch, and the Wardrobe (her favorite), The Secret Garden, A Little Princess. Somehow, lots of stories of children separated from their parents. Lots of little girls love their dolls, or have imaginary friends, and read stories, and all of this may have occurred without his absence. But these had an extra purpose- they were placeholders. In the beautiful story, “A Little Princess,” the main character’s father dies. Sara takes comfort in the doll he’d bought for her- choosing to believe that Emily comes alive when she’s out of the room. When she’s forced to live in a cold attic as a servant, she tells the other servant, Becky, beautiful stories from her imagination. “If I go on talking and talking,” she says at one point in the book to another friend, “and telling you things about pretending, I shall bear it better. You don’t forget, but you bear it better.” And so did we, my daughter and I- bear it better. After five years, while walking up my driveway alone one summer night at dusk, I wonder about the emptiness- if that same gaping absence will always stay. What can fill that kind of emptiness? Even when the loss isn’t new and time has done its cruel work- in the quiet moments- there it is. I speak on Skype to my old grief counselor for the first time in years nearing the five year anniversary of his death this past July. I tell her about my anxiety and all the tools I use to cope with it, but that at the core is a need to trust God again. She agrees. She tells me I’m nearing a new stage. The stage of grace. “It is the nature of grace always to fill spaces that have been empty,” says Goethe. “All the natural movements of the soul are controlled by laws analogous to those of physical gravity. Grace is the only exception. Grace fills empty spaces, but it can only enter where there is a void to receive it, and it is grace itself which makes this void. The imagination is continually at work filling up all the fissures through which grace might pass,” writes Simone Weil. We honor the absence, we hold it, and we memorialize it through stories and even play. And then there is grace. It doesn’t mean giving up your placeholders. In many ways, they actually make a way for it to pass through- the flowers, the stories, the empty cello case. It just means you don’t have to try so hard, to will these placeholders into being, or fill this gaping hole at the core of your life. Keep them as long as you like, as long as you need for whatever loss you’ve had to endure. This is the way we “win through” as Bonhoeffer says, “even at the cost of pain.” This is the way we “bear it better.” Emptiness and grace, loss and favor, existing together. A few weeks ago, I picked up the phone to hear someone speaking to me in Korean. That happens sometimes when your last name is Korean. When I told her in broken Korean that I don’t speak Korean, she switched over to English and told me that she was calling from World Vision- the organization where Dan and I sponsored a child- a child that we selected because he was born on the day that we met. She asks to speak to Dan. I tell her she can’t. She says she’ll call back. I tell her he died. She is sorry and asks if I want to take his name off of the account. It is the only mail I receive now that still has his name. “If you don’t mind, can you please leave it?” I ask. But also a few weeks ago, I find myself, strangely, really for the first time, sitting smack in the middle of my bed, surveying my surroundings. And I stay there. Grace. I want to dedicate this post to those who suffered loss on 9.11.01. I was in NYC on that day, and I now know a few 9.11 widows in my circle. I’m not sure I’ve ever had a more vivid and brutal image of emptiness and absence as I did driving in that next day to a skyline with no Twin Towers, only dark smoke where they should have been. Let us never forget. 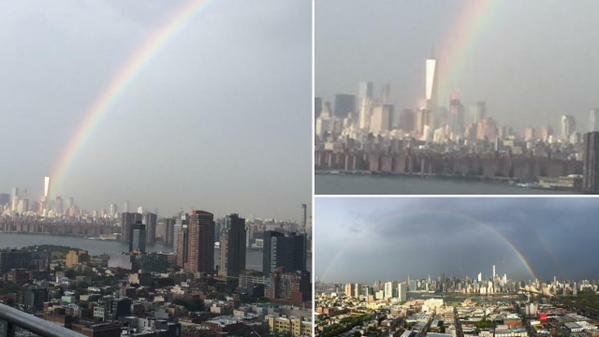 Let us keep our placeholders for them: tall laser lights suspended, a lump in the throat when we tell our children about the events of that day, a rainbow. NYC Image courtesy: Ben Sturner (@leverageagency / Twitter)) found here. Hi Becky- which link are you referring to? Thanks. Julia, thank you for giving a word for the concept I have been trying to define. Placeholders, YES, that is it. I’ve been making a list of all the things I took from my parents home the day after my mom’s funeral: her hairbrush, balled up pairs of socks, costume jewelry, a magnifying mirror, a mug I made her in grade school. I threw them into a plastic garbage bag in a manic race through the house. My dad did this too. I remember coming across a yogurt in the small fridge in her closet. It was hers, and the expiration date outlived her. He didn’t throw it out for years. 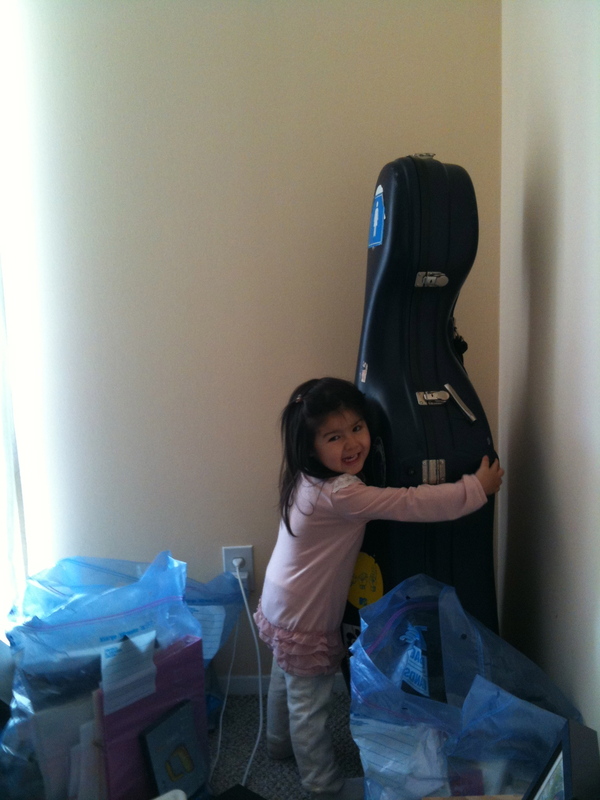 That picture of your daughter hugging the cello case is both beautiful and devastating. Thank you for defining placeholders and the importance of being able to, finally, let them go, because the real placeholders are in our hearts forever. This is also a heartfelt way to honor 9/11. May we always carry those placeholders for all those who died and all those who still mourn. Well said Dana. The yogurt your dad had is poignant. I still…have my husband’s hot sauce in the fridge. It’s another placeholder. My heart leapt to read this: “I tell her about my anxiety and all the tools I use to cope with it, but that at the core is a need to trust God again.” So glad you are in this new stage of grace.